Aurora’s coolest place to be during the hot days of summer. Take a splash! The Aurora Aquatic Facility opened in 2014 and is open during the summer months from approximately Memorial Day (end of May) up to the start of the school year in August. The pool is served by pool managers, concession stand managers, and a number of lifeguards and cross guards. 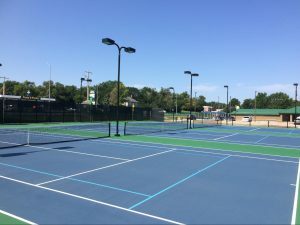 The Aurora Tennis Facility Project Team and the City of Aurora partnered to develop and construct a Tennis Facility east of the Aurora Aquatic Center within Streeter Park. This facility not only replaces the previous Tennis Facility removed due to the construction of the Aquatic Center but will provide additional recreational activities within the facility. The Facility was completed in June 2018. The Lions Club Softball Fields are located on the north end of Streeter Park. 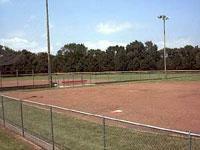 There are two ballfields used heavily during the summer months for league games and tournaments. Teams are available for all age groups. The Streeter Park campgrounds are conveniently located near downtown Aurora and are available year round to the public. 2. Three nights per stay. 3. FREE Camping, donations requested. 4. Donation drop box located under the shelter at campground entrance. The Twin Cottonwoods stood alone on the bank of Lincoln Creek in the middle of the plains. The symbolic significance of these trees, along with their location in the center of Hamilton County, made them the logical location for a new town which would become the County Seat. Miller and Thorpe camped near the trees in June of 1871 and dug out a shelter in which to live. For many years the Twin Cottonwoods of historic fame stood in all their splendor until the ravages of age and disease gradually claimed them. However, they were preserved in a beautiful oil painting produced by Aurora’s own artist, the late Edwin Tuepker. This handsome picture now hangs in the Plainsman Museum. These trees were located in the present Streeter Park. Firewood was mighty scarce through these early years, and while many other trees and shrubs of lesser note were chopped for firewood, the Twin Cottonwoods, held all in awe by their majesty, and their lives were preserved. The Twin Cottonwoods monument can be visited in Streeter Park in Aurora. During the 1930’s, Nebraska suffered one of the most serious droughts in its recorded history. In all parts of Nebraska rainfall was far below normal. In 1936, corn yielded only 1/10 as much per acre as it had during the years 1923-1932. The dry powdered soil began to blow, and as dust storms obscured the sun, parts of Nebraska and the Great Plains became “the Dust Bowl”. Between 1930 and 1940, the state declined in population because of the unfavorable agricultural conditions. This experience resulted in the increased use of deep-well irrigation. Nebraska is fortunate in having the largest supply of ground water in the central part of the United States. Hamilton County lies somewhat east of the center of the irrigation well area in Nebraska. 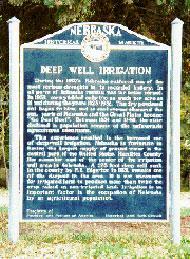 A 225 foot deep well, sunk in the county by F.E. Edgerton in 1931, remains one of the deepest in the area. It is not uncommon for irrigated land to produce more than twice the crop raised on non-irrigated land. Irrigation is an important factor in the occupation of Nebraska by an agricultural population.